The film is barely 30 seconds of silence. Two actors, no words – and four on-screen kisses. “These are not chaste kisses, they are quiet passionate kisses. And they’re having a lot of fun, they’re laughing, she coyly shakes her head,” says University of Chicago cinema and media studies professor Allyson Nadia Field. What may seem common by today’s movie standards was quite sensational when this film was made in 1898. What’s more rare is that the two actors here are African-American. Field says that kind of minstrelsy in the late 1800s and early 1900s was a mainstream form of entertainment. 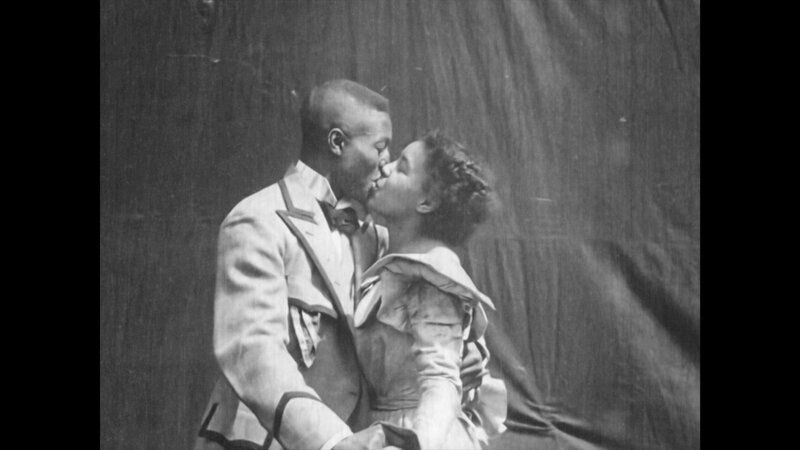 The two performers in this film, Saint Suttle and Gertie Brown also performed in a vaudeville theater company, The Ragtime Four. The film was marketed and sold through Sears & Roebuck catalogues, by silent filmmaker William Selig. It was shot at his studios in downtown Chicago, at 43 Peck Court, what is now East 8th Street, between State and Wabash. Figuring all of this out – as well as the names of the actors – took some heavy detective work on the part of Field, and a colleague at the University of Southern California, who discovered the old nitrate film. “It’s rare that a film, that’s a nitrate film from this period, survives at all. Over 90 percent of films from the early silent era are lost. The fact that it survives and is in such good shape is already remarkable,” she said. Field noticed perforated holes in the film itself, and linked it to Selig’s Polyscope camera – a knockoff of the French Lumiere Cinematographe. “The Polyscope films looks like Lumiere films, but they are Selig,” Field said. Upon hearing of this discovery, Hollywood filmmaker Barry Jenkins, maker of critical hits like “Moonlight” and “If Beale Street Could Talk,” tweeted, “I – words fail me” with a black heart emoji, for black love. These 30 seconds are the entire film, not just a clip. Films at the time were all short, shown in a lineup with several others, typically depicting blacks in racist, stereotypical performances. “We really can’t underestimate the power of just the representation of black humanity at this time, this is a time when American cinema was very hostile to African-Americans, it was not a hospitable place for black people. So, just to have this brief 30 seconds of natural joy is really quite remarkable and the fact that it survives over 100 years later is a gift to us,” Field said. Whether or not this film tried to, Field believes the two in it, Suttle and Brown, made a powerful statement, without saying a word. 2018 Academy Awards: A More Inclusive Age of the Oscars?